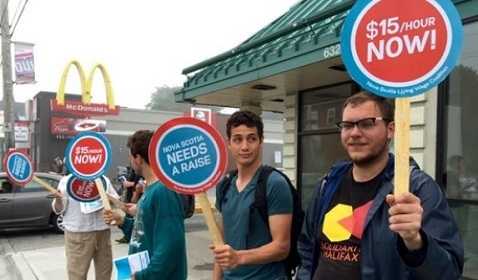 On Wednesday, July 15th, about 20 students, workers, and low-income earners - including Nova Scotia ACORN members - held an info picket outside the McDonalds on Quinpool Road. The campaign is fighting for fair wages for all workers across Nova Scotia. Minimum wage rose by 20 cents on April 1, 2015, but this small increase pales in comparison to the rising cost of rent, food, and other basic necessities. Tired of wages staying low while rent goes up? Want to join the fight? Join ACORN! Check out the campaign website and stay updated on future events. The Fair Wage Campaign is a coalition of Nova Scotia ACORN, Canadian Federation of Students, Dalhousie Student Union, Halifax-Dartmouth District Labor Council and Solidarity Halifax.